My Body Is Everywhere, Where Is The Body? an exhibition by the artist duo Hollis + Lana, considers the fragmented body joined with architectural space. 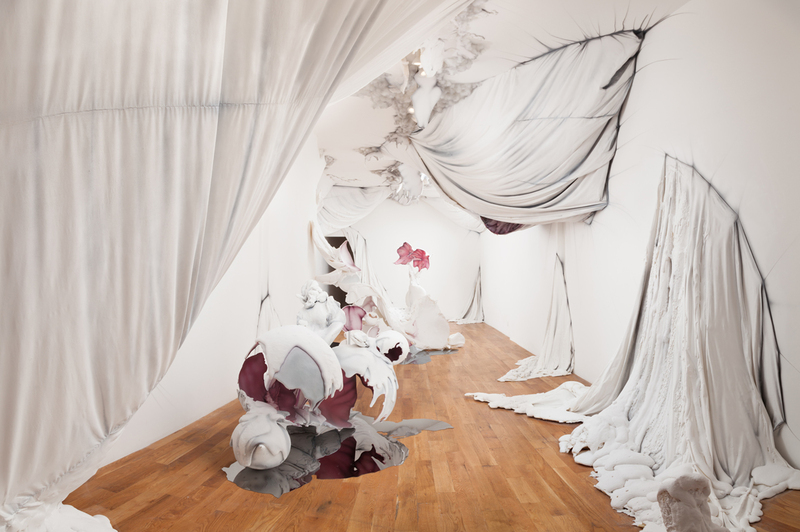 Running June 30 – July 30, 2016, the show features sculptural and relief works that re-configure the gallery into an immersive biomorphic chamber. Within a fictional yet familiar model, biology and psychology expand beyond an identified self, taking on qualities of a de-centered and ever-expanding environment. Admitted in small groups viewers will be invited to explore this imposing installation. 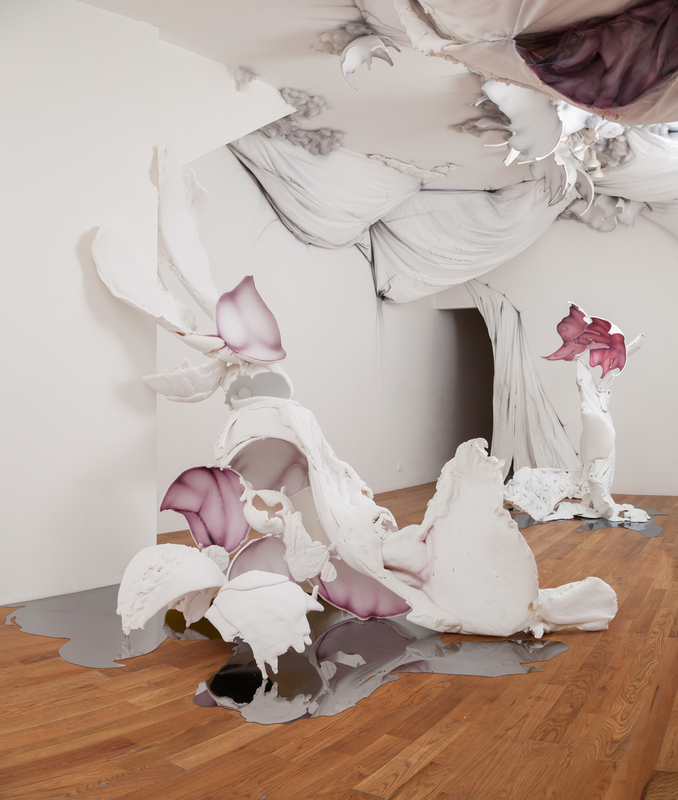 Employing the popular vernacular of science fiction, Hollis + Lana engage with concerns and fantasies of uncontrolled growth. Akin to genre narratives such as the 1958 cult film The Blob and epitomized by the 1980’s manga series and subsequent anime film Akira (1988), the body transitions from the contained to the uncontrollable as the psyche moves from the personal to the impersonal. In a then distant 2019, following WWIII in Neo Tokyo, a young man’s psychic power and anguish manifests through the explosive growth and deconstruction of his human form. Unleashed by military-aided technological intervention, he begins to absorb the built environment, as well as other individuals towards catastrophic ends. These and similarly entertaining and dystopian visions have undoubtedly captured not only the viewing public’s imagination, but also those of government and military institutions. Various attempts to weaponize the human mind and body have been well documented in the now defunct cold war programs such as the CIA's MK-Ultra and Remote Viewing mind control and telepathy experiments. This view of the body and mind as a container of ominous power to be unlocked by technology have helped to shape our current networked relationships. While humans have yet to develop supernatural powers, the increasing nature of the internet — itself a product of the military research program Arpanet —to position individuals as viral agents mirrors the uneasy yet alluring depiction of the unbound self in these genre narratives. 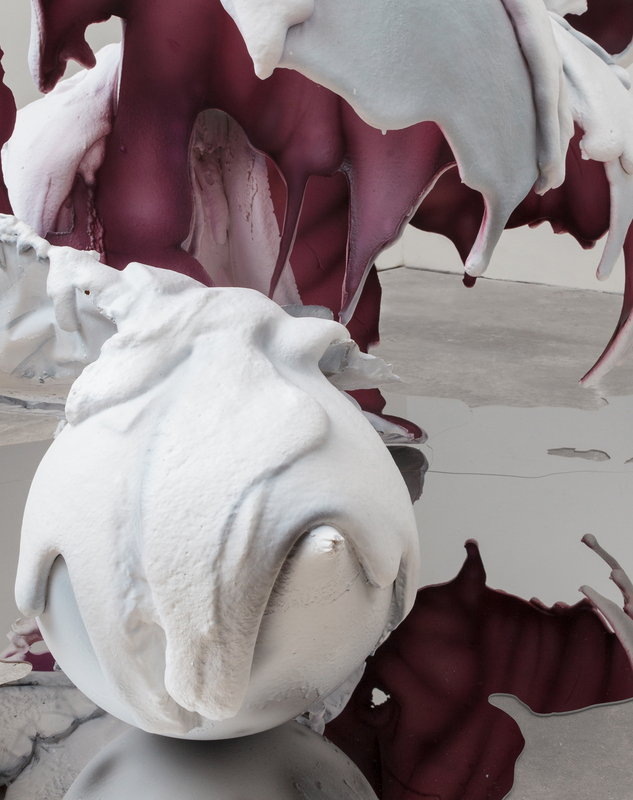 The ambiguous and imposing forms of Hollis + Lana's give visceral shape to an overwhelmingly connected present derived from fictional images of the near future. With no opportunity to view the installation externally as a whole, the exhibition must be experienced – as the present – from within. Like the characters in the 1966 science fiction film Fantastic Voyage, viewers can encounter the unidentified body and expanded self as space with a heightened awareness of their singular body moving through it. Appealing to Sartre’s notion of the self existing only in relation to surrounding hostile objects and extending Anthony Vidler’s “lost bodily unity” in his essay The Building in Pain, the formidable and irregular structures within the gallery encourage an evaluation of the viewer’s own vulnerability and potential as part of a larger mass. In the making of the artwork, Hollis + Lana had to quickly adapt and grapple with the apparent “will” of their own creations. Through a process of molding quick-setting composite material, the sculptures and installation present a sense of organic motion. Frozen in place, intentional, yet unpredictable gestures appear to extend or have broken-off from the building itself. Detailed painting of their surfaces gives further life to these embryonic and architectural vestiges. Mirrored steel, cut from silhouettes of the sculptural forms and placed throughout the installation serve as both shadows and reflecting pools. This duality between projected negative space and the expansive quality of the mirror parallels an unresolved relationship between accumulation and loss. As the body and self expand, must they also dissipate into the monstrous? Conor Hollis and Amorette Lana began collaborating in 2008. Independently working with a variety of materials and subject matter they have coalesced to become one unified artistic voice. Together, Hollis + Lana focus on expanding the reality of perceptual possibility through mutual gesture. Their two dimensional and three dimensional works have been exhibited in galleries and institutions throughout the US including recent shows in Denver, San Francisco and Chicago. Recent public commissions include the City of Denver, Seattle and New Orleans.